The Cattail birdbaths from Achla Designs are sculptural pieces of garden art that also benefit the wildlife in your yard. Birds will also love having a safe place to cool off and drink some water, and gardeners will love having a beautiful piece of sculpture to accent the plantings. 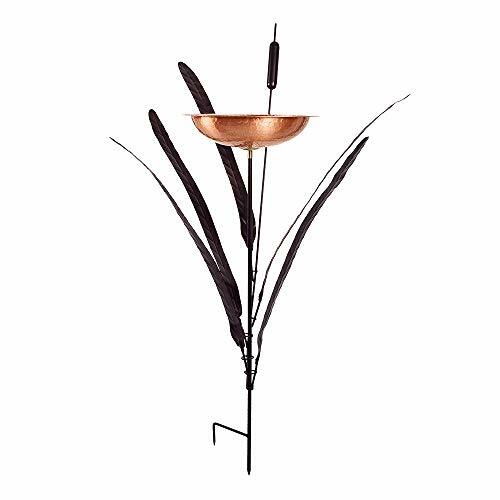 The bright and lustrous finish of the copper bowls create a beautiful contrast against the black spray of wrought iron leaves and cattails. They add depth, dimension, and an artful addition to a perennial bed, water feature or other natural setting. 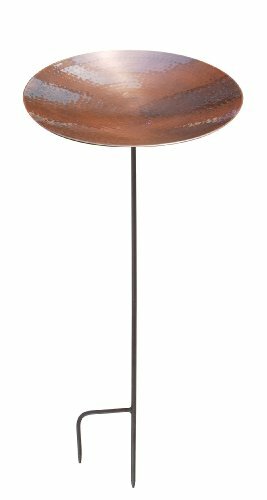 These sculptural bird baths stands spike directly into your garden bed to hold one or two hammered solid copper bowls. They assemble easily and without any tools, so they can be installed easily. Our in-house design team brings together varied expertise in the fields of mechanical engineering, architecture, fine art, sculpture, and metallurgy resulting in a team that produces high-quality, beautiful products for home and garden. We continue to add to our exquisite product line each year, resulting in a large selection of items for you to choose from for your home decor. We take pride in providing exceptional products and customer service and keep our warehouse thoroughly stocked all year long. 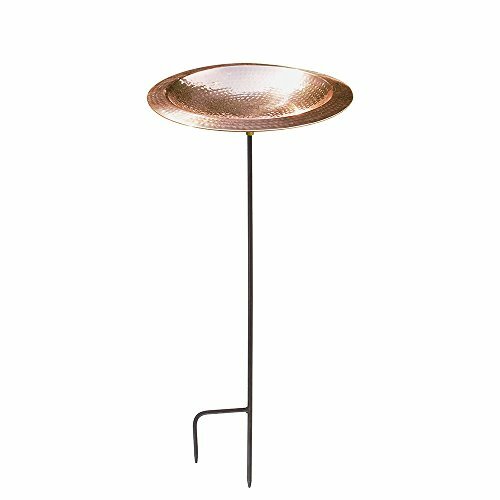 Classic and simple in design this hammered copper Birdbath has concentric rings. Made of solid copper and available in Polished or Burnt Copper finish, this bowl is available alone or with a threaded Stake. It can also be used with any of our mounting brackets for poles posts or handrails. This is a lustrous hammered solid copper birdbath bowl with peened texture in concentric rings and a wide rim for perching. The plain bowl is available separately or with Hanging Ring Kit. The threaded bowl is available alone or with a threaded 36" stake. It can also be used with any of our mounting brackets for poles posts or handrails.